Calling all Professional Musicians; Piano Teachers; Concert venues; Churches; Schools; Individuals. Choose To The Tune Of Pianos to take care of your beloved piano. Paul Hopkins, Piano Tuner. With over 30 Years experience including: Working for Bluthner Pianos; Symphony Hall; National Indoor Arena plus tuning for many internationally acclaimed musicians. To hear some of our customers playing their pianos and making remarks about the tuning after we tuned the piano, please click on our Audio Testimonials page link above. Paul has been vetted by the Disclosure and Barring Service (DBS) and therefore approved to work in situations with vulnerable adults and children. (Previously known as CRB checks). The piano is a highly developed, complicated piece of equipment. It contains about 240 different lengths of highly tensioned wire. (Approx. 160lbs per note and a 15% increase in the bass giving you an overall strain on the frame of 21 tons approx.) These lengths of wire to make up the 85 to 88 notes spread across the musical range. Plus, for each note, there exists a mechanism, which in the case of an upright piano contains up to 14 different moving parts. In the case of a grand up to 22 per note. I am based in Orpington, Kent. The area I cover is roughly with in a 50 mile radius of Orpington. I will travel to further area's but this usually means a small surcharge to cover the transport costs. If you live in a remote area but have friends who also have pianos, I make a reduction according to the number of jobs. 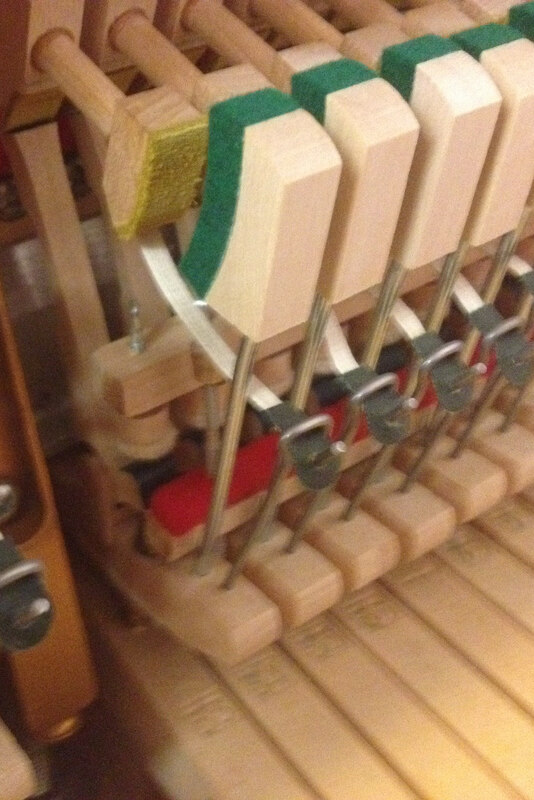 Does your piano need repairs, voicing or regulating? When I am tuning your piano if I find that your piano needs any of these I can arrange this work to be carried out for you. 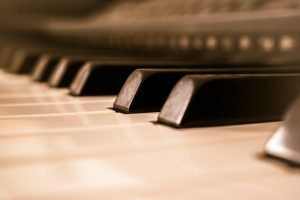 For example, if you play the piano several hours a day, and work to a performance standard, it is quite likely, that for your own piece of mind, and that of your listeners, you may need to have your instrument tuned frequently. This could be as often as once a week. If you are a parent with a child in school who is learning to play the piano, routine maintenance becomes important. For, a student feels frustrated if clashing notes or poorly functioning and badly regulated action parts foils his or her attempts. We recommend for a family with a piano in general uses that we visit no less than every 6 months. Often more frequent visits may be necessary this isn't out of the ordinary on some pianos. The piano is a highly developed, complicated piece of equipment. It contains approximately 240 different lengths of highly tensioned wire, with approximately 160 lbs. of pressure per string and a 15% increase in the bass. This produces an overall strain on the frame of about 21 tons. These lengths of wire make up the 85 to 88 notes that spread across the musical range. Each note has its own individual mechanism, the combined total of which in the case of an upright piano adds up to 14,000 moving parts. In the case of a grand, the total reaches as high as 22,000 parts. the piano must be maintained at a specific tension to achieve a good musical sound, the matter of maintenance becomes an on-going process. A piano consists mainly of wood and iron, and both materials are subject to movement. The movement of the wooden soundboard and the frame causes the wires to change tension without prompting by the user. Thus, it becomes necessary to set up a minimal schedule of tuning of the instrument to ensure reliable and pleasing results. This schedule isn't a hard and fast one, but we can make recommendations and set out guidelines. Once a year is a minimum for most pianos. Most piano makers recommend twice a year and some three times a year. Humidity and Temperature have a big effect on pianos staying in tune more so than playing. Quite a lot of homes in the months of November to April tend to have a humidity range from 38% 40% and from April to November 40% to 65% and some as low as 20%. This swing makes the soundboard swell and shrink this up and down movement pull and loosens the piano strings putting the piano out of tune. Pianos that are in rooms with the humidity below 38% for several months are causing the piano long-term damage.